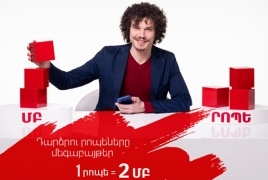 PanARMENIAN.Net - VivaCell-MTS announced on Friday, February 1 that by March 31 Viva prepaid and postpaid tariff plan subscribers can convert the embedded on-net airtime to MBs, where 1 minute = 2 MB. To exchange the minutes with MBs, simply tap on the My VivaCell-MTS application from your smartphone. The application is available on both Google Play and App Store. The remaining airtime after the conversion should be at least 500 minutes. The prepaid subscribers can use the converted MBs till the expiration of the packages provided by Viva tariff plans. The postpaid subscribers can use the converted MBs till the last day of the calendar month. In case one of the packages is consumed before the expiration of the validity period, one can reactivate the packages of the current tariff plan by dialing *161*4#: in case of reactivation the remaining packages, as well as the converted MBs are zeroed and new packages are activated with a validity period of 30 days. Also, converted MBs are not available in roaming , the company said.